Beautiful Gazebos at affordable prices aren't hard to come by at Boerne Deck Builder. We put all our effort into building your Backyard Gazebo either exactly to your specifications or Custom and Unique with our Creative Designs. Your yard will stand out and be the talk of the neighborhood when our Creative Design Team develops your Backyard Masterpiece. Our Builders will Blueprint your design, and after your approval will begin on wood selection. We recommend Pressure Treated Pine, Cedar, or Composite. With the shade and gathering space a Gazebo provides, you will be able to host a number of events! Our Wedding Gazebos are Masterfully Designed and Built with a Bride and Groom in mind. Finished out with Custom Embellishments and topped with a beautiful coat of paint or stain, your special day will look Amazing for all to see. Gazebos also make great picnic areas. With a covered area in the yard to sit and enjoy the weather, friends and family can enjoy the comfort and beauty of outdoors. 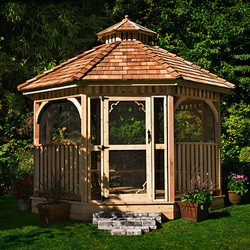 When planning for a Gazebo, we will come out and survey the land, informing you of the best, or most level, areas for it to be built. We will also level the ground if you have a specific area. No job is too big or too small for Boerne Deck Builders. We would love to hear from you! Call us anytime at (830) 428-2999 or send us a message using the form on the right.